COLORADO SPRINGS, Colo. -- USA Hockey will host its 2010 Annual Congress from June 10 through 13 at the Crowne Plaza Hotel in Colorado Springs, Colo. The President's Awards Dinner will take place on June 12. Among the honorees will be Buffalo Sabres goaltender Ryan Miller, who will receive the Bob Johnson Award, and Toronto Maple Leafs general manager Brian Burke, who will receive the Distinguished Achievement Award. Both were also part of the U.S.'s silver medal-winning team at the 2010 Winter Olympics in Vancouver. In addition, Ron Wilson, head coach of the Toronto Maple Leafs and the 2010 U.S. Olympic team, will be in attendance. Ryan Miller backstopped the U.S. Olympic Men's Ice Hockey team to the silver medal at the 2010 Olympic Winter Games and was named both the tournament's MVP and its best goaltender. He played all but 12 minutes between the pipes for Team USA. In his first three preliminary-round games, Miller allowed just five goals on 71 shots, including a 42-save effort in Team USA's 5-3 victory against Canada. In the quarterfinal and semifinal rounds, he turned aside all 37 shots he faced and held a dangerous Canadian offense in check throughout most of the gold-medal game. Miller posted a tournament-best .946 save percentage in six games and his 1.35 goals-against average is the lowest in U.S. Olympic Men's Ice Hockey Team history. A long-time hockey executive with a history of success at every level, Brian Burke's contributions to the growth of hockey in the United States are immeasurable. 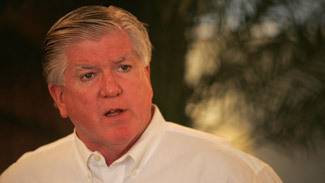 Burke most recently served as general manager of the silver medal-winning 2010 U.S. Olympic Men's Ice Hockey Team. He also served in the same capacity for the U.S. Men's National Team at the 1993, 2009 and 2010 IIHF World Men's Championships. The president and general manager of the NHL's Toronto Maple Leafs, Burke previously served as executive vice president and general manager of the Anaheim Ducks from 2005-08, guiding the team to the Stanley Cup title in 2007. Prior to joining the Ducks, Burke was the president and general manager of the Vancouver Canucks from 1999-2003, engineering four consecutive seasons of at least 90 points and earning The Sporting News' NHL Executive of the Year. He also worked in the NHL front office as senior vice president and director of hockey operations from 1993-98, and was honored with the Lester Patrick Award for his contributions to hockey in the United States in 2008.